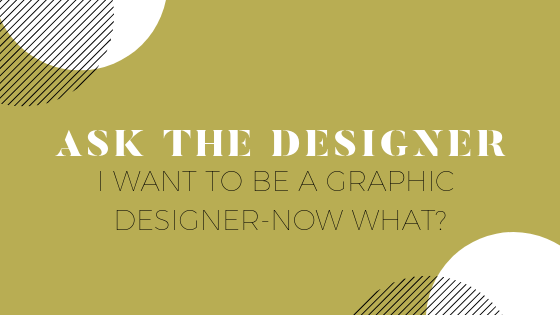 Up this week: I want to be graphic designer—now what? By chance, actually. I was in my last semester as a PR major (I wanted to go into fashion PR) taking an advanced editing class. This was the first time I really got a chance at designing anything and I was hooked instantly. Of course, being in the last semester of school meant not changing my major, so after graduation, I decided to get my master’s but obtain a second bachelor’s first since I’d have to go back and take all design classes anyway. Long story short, I got an interdisciplinary studies degree in art and worked on building my portfolio for the post grad world. Between gigs, I was learning more skills on Illustrator and designing things for dirt cheap ($50) to build up my portfolio. I got lucky that my mom’s coworker knew someone that was looking for a contractor and I got the position, so I was able to build up my skills on the job (I highly recommend this if you can). - InDesign, Photoshop, and Illustrator basics are always good to know. - Color theory to understand the importance of color and how it impacts mood, buying behavior, etc. - Basic/Intro to design classes also help for the introduction of graphic design basics. - Web design/coding basics. You can’t go wrong learning CSS and HTML, even if you don’t plan on getting into development. Humble opinion: no. There’s nothing wrong with art schools, but if you’re going to be drowning in debt or you can’t afford it, find a local college with a good design program. They’re out there. Your work will speak for itself, so don’t get hung up on the name. It’s just fluff. It depends on the school and the program. If I were a bit smarter, since I already had a degree, I would have done a continuing education certificate in graphic design. I do think having a business degree (especially marketing), is good to have to understand basic business principles, even if it’s a minor. Knowing how to set up and price yourself as a business is something you don’t want to learn on your own, though it is good growing pains. Also, learning about self employment taxes, LLC’s, etc…HALP. - Don’t take critiques personally—use it as improvement for your skill. I’m a sensitive person (gasp) and think my work is a reflection of me. If it wasn’t an automatic, “YAAAAS!” I used to be so angry. “I worked HARD!” Of course I did, but someone saw something more in me and my talent. That’s a good thing. - You’re not going to stop learning. I’ve worked in a lot of the Adobe programs more than once, and as the industry changed, I had to keep up which meant I had to keep learning. With updates changing how functions work, you’re always learning more to be better. I started design right as digital grew. I knew nothing about web and was solely a print-focused designer. However, I, for a lot of reasons, taught myself, HTML and CSS (also, a shout out to Xanga and Myspace for getting me through), and how to take my print skills and apply them to a digital and social format. - The comparison game will kill you. There are a lot of talented designers out there, and you’re one of many. That’s a great thing! I love striving to be the best, but I have to be careful not to feel envious admiring their work. - Find a style that’s you. I’m such a stickler for clean lines, but I want to be unique with them too. Black and white are my favorite colors, and I’m not too big on super “fancy” fonts. It’s really cool when people see a design and say, “Hey C, this is so you.” That means my aesthetic makes a strong impact and speaks for itself. - Speaking of style, your style isn’t for everyone. This is why you don’t play the comparison game. When you approach clients, they may go in another direction because they have a different vision in mind. That’s cool.